We’ve said it here, and it’s been said elsewhere: lithium-ion batteries just don’t pencil out for backup power. The incumbent technologies, like diesel generators and lead-acid batteries, have a big lead in affordability for essentially the same service. That flies in the face of the conventional wisdom on new battery value propositions. It was only a few months ago, after all, that Tesla surreptitiously smothered its 10-kilowatt-hour Powerwall battery, which was designed specifically for backup power use. I followed up with Smith to see how those numbers checked out. Of all the batteries Sonnen has sold in North America, he said, 90 percent are being used for backup power. That’s not based on customer surveys or estimation -- it’s based on the mode in which all those customers have chosen to operate their Sonnen batteries. The backup mode keeps almost all of the battery’s capacity on hand in case of power outage, instead of using more capacity to store rooftop solar for later, for instance. 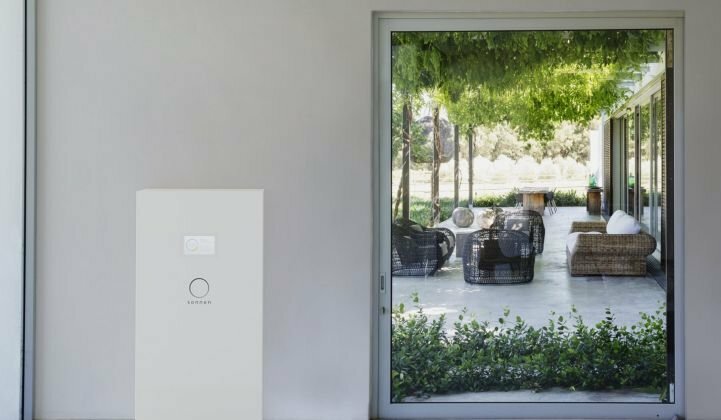 That means that almost all of Sonnen’s customers are foregoing potential savings from a more active use of their home batteries, in order to feel secure in their ability to respond to blackouts. In choosing lithium-ion batteries for this purpose, they’re also electing to pay a significant premium for backup power. Diesel generators sell in the range of $2,500, Smith said, whereas a 12-kilowatt-hour Sonnen Eco battery system would retail for around $18,000 plus installation costs. Something is at work here beyond a simple cost and benefit analysis. Lithium-ion batteries are relatively new for the home-use market, and concepts like self-consumption and time-of-use electricity rates are still confusing to a lot of people. Everybody understands the concept of backup power, however, and that use case tends to resonate with residential customers. Sonnen took that and ran with it. The company website prominently displays the pitch “Never worry about the lights going out” as a reason to buy. It has discovered evocative and emotionally resonant case studies, like that of an elderly woman whose Sonnen battery kept her house powered when the rest of her neighborhood had gone dark. She invited everyone over to charge their phones and drink lemonade. That sense of safety and security doesn’t fit neatly into the ledgers. Lithium-ion can also do certain things the incumbents can’t. It’s got a smaller footprint, cleaner chemistry and longer cycle life than lead-acid batteries. And, unlike diesel generators, it doesn’t belch pollutants into the air and subject its owners to a clamorous din while operating. More crucially, though, diesel generators still rely on diesel, and the kind of situations that knock out power for days on end also tend to shut down gas stations. Case in point: the nuclear reactors in Fukushima melted down not because of earthquake damage, but due to loss of power that shut off the reactor cooling mechanisms. The plant’s diesel generators failed to save the day because they were flooded by the tsunami, which also washed their diesel fuel tank out to sea. A diesel generator alone does not guarantee resilience. It also can’t keep solar panels running. Customers who have batteries paired with rooftop solar installation enjoy an entirely different outlook. Grid-tied rooftop solar shuts down when the grid cuts out, but Sonnen’s home energy system isolates itself in a temporary microgrid. That allows the solar modules to recharge the battery each day, and it keeps the home operating at a 21st-century standard of living until grid power is restored. Installers that are already selling a home solar system have found success by offering storage as an additional part of the package, Smith said: For just $100 extra each month, for example, customers won’t have to worry about blackouts anymore. That’s a lot easier to say yes to than a side-by-side comparison with the alternatives. Lithium-ion battery prices are still falling, so the price gap between them and the competition will continue to narrow. But Sonnen’s data shows that prices alone don’t determine whether a purchase will be made. If battery vendors can better understand the purchasing motivations beyond the basic cost appraisal, they might not have to wait so long to scale.